Prosjekt Haiti offers services related to providing information about Haiti, completing studies and/or analyses, arranging visits, translation services and providing contacts within different parts of Haitian society. Further, we arrange stays in Haiti for students on relevant study programs, including workshops and seminars. We also collaborate with Senja Videregående Skole, Finnsnes, Norway, where students from Petit Troll get the opportunity to study at the International Baccalaureate (IB) diploma program. Prosjekt Haiti has been present in Haiti since year 2000 and has built considerable competence with respect to the Haitian culture and society. As a Haitian-Norwegian organization we have unique knowledge about local affairs that we are happy to share with others. 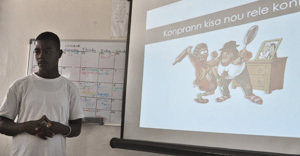 We are currently part of a pilot project related to prohibition of violence/alternative dispute resolution among youth in Port au Prince. This is an innovative collaboration between Center for Peace Studies at the University of Tromsø and Prosjekt Haiti. 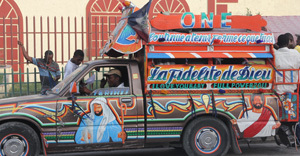 The aim is to promote and advance peace culture in neighbourhoods in Haiti. Prosjekt Haiti offers creole lessons with flexible schedules, either for groups or private lessons. The lessons take place at Petit Troll in Delmas, Port au Prince.